Montalvo Arts Center | Centennial Summer Luncheon - SOLD OUT! Centennial Summer Luncheon - SOLD OUT! Wednesday, August 29, 2012, noon - 1 p.m. TICKET PRICES : $38 | 20% of ticket prices are tax-deductible. Reservations required through the Montalvo Service Group. The Montalvo Service Group hosts their famous Summer Luncheons each year in Montalvo's historic Villa, and this year, it's a celebration of our Centennial! Lovely wine and salad lunches are featured every Wednesday from July 11 through August 29. 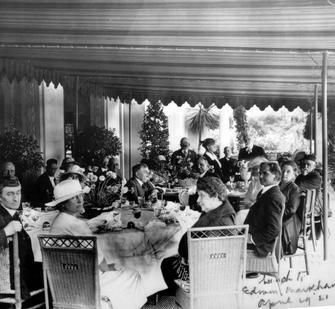 Dine al fresco on the front and side veranda of the villa, just as Senator Phelan and his guests did nearly a century ago! Seating times are at 12:00, 12:30 and 1:00 pm; Reservations fill quickly. Menu: Roast Pork Tenderloin on a bed of caramelized spiced gala apples. Orzo & roasted vegetable salad. Hericots verts & pear tomatoes with herbed vinaigrette. Mini corn muffin & honey butter. Bing cherry tartlet with creme fraiche. Vegetarian options available on request; order at the time your reservation is made. View all of the luncheon menus. Visitors also enjoy a fashion show at each lunch, with various outfits from Los Gatos- and Saratoga-based clothing stores. For more information and to make your reservations, contact the Montalvo Service Group at 408-961-5823 or email the Montalvo Service Group. All proceeds benefit the restoration and preservation of the historic Villa, built in 1912 by U.S. Senator James Duval Phelan.